What works to promote walking at the population level? is the subject of a systematic review by authors Charlie Foster et al. Alison Pask reviewed this paper published in a special series of the British Journal of Sports Medicine (June 2018). What Extra Value does ANA Provide? 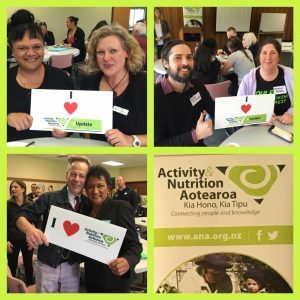 What we do at ANA matters to the nutrition and physical activity sector. Find out more about the findings of the latest ANA Annual Survey. The Ministry of Health has launched a new tool on its website which enables people to calculate their Body Mass Index (BMI). Did you know that you can order printed copies of Ministry of Health resources directly from their website? Healthy weight gain in pregnancy - poster. Note: These resources are for practitioners and not health education resources aimed at the public. 5 + A Day have developed some amazing new posters showcasing beautiful fresh fruit and vegetables, including new posters in Te Reo. These posters can be ordered directly from their website. The Hutt Valley DHB has recently published their wellbeing plan. This plan sets out Hutt Valley DHB’s bold vision for how they want to make the Hutt Valley a healthy place for whānau and community to connect, grow, live, learn, work and play.